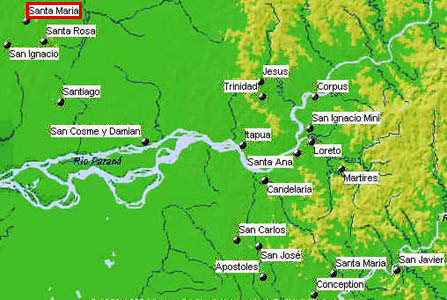 The province of Paraguay where Santa María de Fe is situated is called Misiones. It takes its name from the Jesuit Missions for the Guaraní indigenous, which were technically known as Reductions. The Missions for the Guaraní spanned just over 150 years, from 1609, when the neighbouring Reduction of San Ignacio was set up, to 1768, when the Jesuits were expelled. Towards the end of this period there were 30 settlements (Treinta Pueblos), spread through Misiones Paraguay, Misiones Argentina, and Missões Brazil. The story of the remarkable artistic and social achievements of these Jesuit Reductions, and of their cruel and bloody destruction, is movingly told in Roland Joffe’s great film The Mission. Today some of these Reductions have ruins, others have museums of art works, and others have no remains at all. Santa María de Fe (“Saint Mary of Faith”) was founded in 1635 further north and moved to its present site in 1669; it has what is in many people’s eyes the finest of all the museums of the Reductions, and a few original buildings including the museum itself. 200 years later, in 1960, the first Christian Agrarian Leagues began in Santa Rosa, a little south of Santa María (at the top left of the map above). 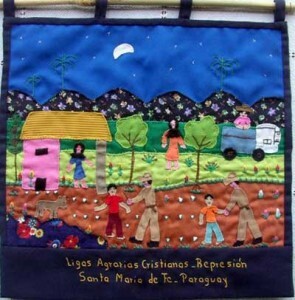 They were communities for the rural poor, where people worked together and shared the proceeds. Like the Reductions they aroused jealousy and resentment among those who saw them as an economic rival. The Christian base communities which began in Brazil at about the same date suffered persecution but survived to the present day, and are admired all over the world. But the Ligas Agrarias Cristianas of Paraguay were completely wiped out by the dictator Alfredo Stroessner in the year 1976. Some people were killed in front of their families; others died under torture; others suffered permanent health problems from the torture; many wives had miscarriages under the stress. The Leagues were destroyed, and for decades afterwards people were afraid to talk about them. But in 2003, some 27 years after the repression, the craft workshop of Santa María responded to the request of a historian to tell the story in pictures, embroidered in appliqué work. 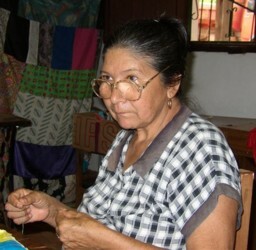 Neni Duarte (pictured), the wife of one of the imprisoned leaders Eliodoro Coronel, designed and sewed the first scenes, working from the memories deeply engraved in her heart. Today, Santa María de Fe is still small and impoverished, but a number of enterprises, notably those supported by the Education Fund, are beginning to make a difference. More on the Visiting Santa María page.